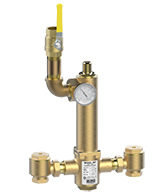 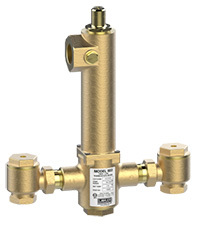 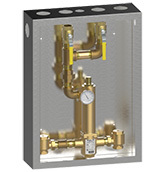 Lawler High-Low Thermostatic Mixing Valves provide tempered water over a wide range of flows in a single valve unit. 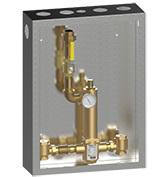 Ideally suited for institutional and commercial applications such as group showers, schools, hotels, hospitals, prisons, and nursing homes. 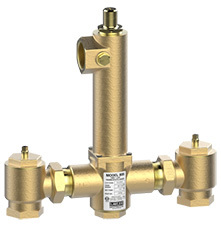 These valves provide three-way protection from scalding upon: 1) failure of the thermostat, 2) shut-off of hot water, or 3) shut-off of cold water. 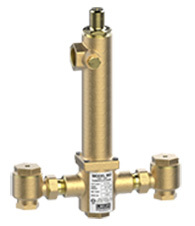 The one piece, single body valve contains a liquid filled thermostat, a stainless steel piston and liner, and is ASSE 1017 and CSA B125.3 approved. 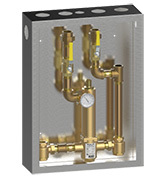 All model series are available with stop & checks, thermometer, shut-offs, cabinet assemblies, and a choice of rough bronze or white chrome finish. The single valve is easier to install, easier to maintain and more cost efficient than multi-valve systems on the market.